Humanity's knowledge of the moon has transformed dramatically inthe last year, thanks in large part to NASA's Lunar Reconnaissance Orbiter,which recently celebrated its first birthday in lunar orbit. Indeed, after just one year studying the moon, the spacecraft hasgathered more digital information on the moon than any planetary mission thatcame before, and the American lunarorbiter is still going strong. Themost dramatic finding the LRO helped observe was undoubtedly the?grains of moonwater ice,revealed by the probe's companion mission, NASA's Lunar Crater Observation andSensing Satellite (LCROSS) in October 2009. Scientistshad speculated on the existence of water on the moon since the 1940s. Butconfirmation came only recently, when scientists announced last year thatobservations from several missions — among them NASA's Cassini spacecraft, DeepImpact probe and the NASA-built Moon Mineralogy Mapper on India's Chandrayaan-1orbiter — had revealed evidence of lunar water molecules or components of them on themoon's surface. 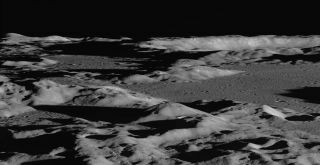 Still,it took LCROSS to help kick up significant amounts of water when it crashedinto a crater near the south pole of the moon, and LRO and otherobservatories to see evidence of this ice otherwise hidden in the permanentshadows within the crater. "Thelevel of coordination required to be able to position the Lunar ReconnaissanceOrbiter to pass over the impact site just 90 seconds after the impact was aspectacular achievement," said Michael Wargo, chief lunar scientist at theExploration Systems Mission Directorate at NASA Headquarters in Washington,D.C. "Itwas very exciting to do a true experiment in space," said Richard Vondrak,LRO project scientist at NASA's Goddard Space Flight Center in Greenbelt, Md. "Most of the work is purely observational, just passive, but with LCROSS,we got to perturb the environment, look at the consequences and learn somethingfrom it." LROand LCROSS observations of the impact mission revealed a variety of otherintriguing materials there as well, such as carbon dioxide, hydrogen, carbonmonoxide and sulfur dioxide. "Theseshadowed regions of the moon are truly repositories for all sorts ofmaterials," said Anthony Colaprete, principal investigator on LCROSS. Thesevolatile materials likely collected over the course of billions of years atthese areas, which at minus 415 degrees Fahrenheit (minus 248 Celsius), havethe coldest temperatures measured anywhere yet in the solar system. Forcomparison, Pluto's surface only gets down to about minus 300 degreesFahrenheit (minus 184 Celsius). "Theyreally provide a treasure trove of information about the formation andevolution of the solar system," Wargo said. Thecameras on LRO are mapping the moon with a spectacular level of detail. Thephotos are so detailed that past Apollo moon landers, equipment and other lunarrovers have been photographed by the probe's main camera. [Historic Apollo 11 moon landerphotographed]. "Wecan see the tracksthat astronauts left behind," Wargo said. "I don't know how anyone can seethose and say we didn't go there." Theother instruments on the probe are exquisitely thorough as well. For instance,its laser altimeter, which is mapping the 3-D topography of the lunar surface,scans 140 spots per second, while past missions only analyzed one to 10. "We'regetting the best images and finest topographical maps that have ever been madeof the moon," Vondrak said. LROis also developing the first radar maps of the far side of the moon — the sidenever seen from Earth. The moon's far side is rougher and has far more cratersthan its near side, including one of the largest known impact craters in thesolar system, the South Pole-Aitken Basin, which is roughly 1,550 miles (2,500 km)wide and 8 miles (13 km) deep. "Ibelieve we'll gain new insights into the formation and evolution of the farside this way for a better understanding of the moon as a whole," Vondraksaid. Bycomparing this new data from LRO with that from old maps, "we can get anidea of what impacts have occurred by looking for new craters," Wargo added. "That will give us a better understanding of the rate at which impactshappen on the moon to understand its evolution and that of the solar system. Also,to safely explore the moon, you'd want to understand what the impact rateis." Asmuch as LRO has discovered so far, there remains a vast amount of data thatscientists are only starting to unravel. "Theamount of data LRO has returned is just staggering," Vondrak said. "Prior missions like Mars Global Surveyor or Cassini measured up to a fewterabytes of data in their entirety. In comparison, LRO has made two releasesof data so far, each about 40 terabytes of data." A terabyte is a trillionbytes — in comparison, the Library of Congress has collected roughly 160terabytes so far. "Ittakes time before researchers have a chance to analyze this exquisitedata," Wargo said. "We're only at the beginning, not the end."